(Location cited as NN 505 032). Aberfoyle Slate Quarries, 18th to 19th centuries. Extensive workings with waste tips and ruined buildings. The route of a narrow-gauge railway to Aberfoyle village can be traced. Two unroofed buildings, probably quarry buildings, are depicted on the 1st edition of the OS 6-inch map (Perthshire 1866, sheet cxxii), but they are not shown on the current edition of the OS 1:10000 map (1978). Information from RCAHMS (AKK) 13 January 1998. NN 505 031 Forest Enterprise wished to attempt to stabilise an old spoil head which was inclined at a dangerous angle, threatening collapse. An archaeological watching brief was maintained by Kirkdale Archaeology during this work, as possible remains of the 19th-century industrial complex could have been revealed. 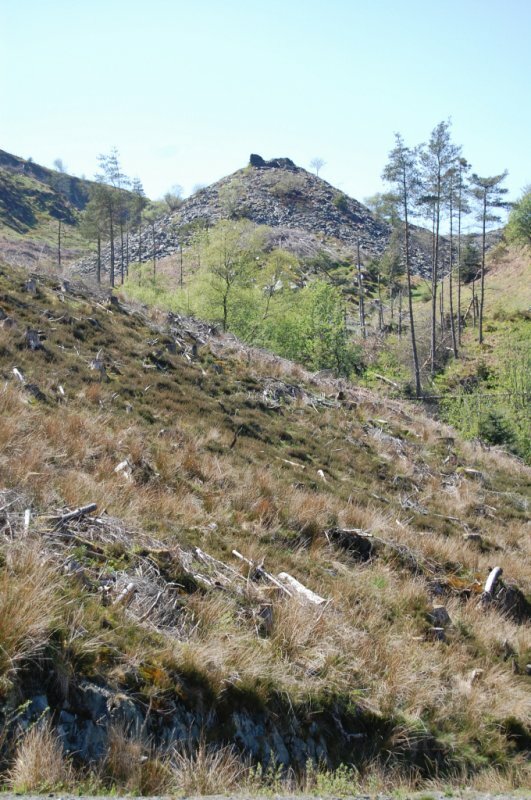 The spoil heap was c 35m high, and ran NE for approximately 70m from the NE corner of the quarry. In the event, no archaeological traces were observed during the stabilisation exercise, and no finds were recovered. Despite the lack of evidence recovered during the watching brief, there still remains the potential for industrial archaeological survival beneath the spoil heaps of the quarry. The website text produced for Aberfoyle Slate Quarry webpages on the Forest Heritage Scotland website (www.forestheritagescotland.com). Look around any Scottish town or village and you'll see the slate tile roofs. Today we usually use slate from Spain or China; however, until the 1950s, Scotland used its own slate. 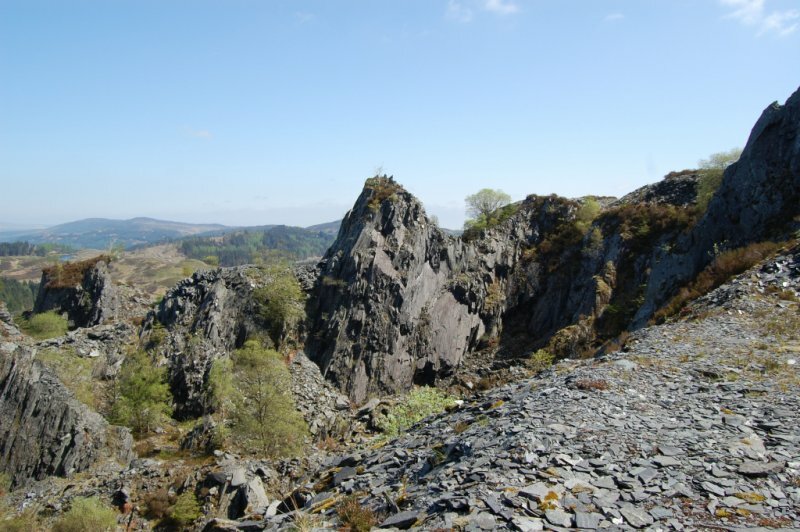 Aberfoyle was the third most important quarry in Scotland and the location of some of the highest quality Scottish slate. In the past, slate was only used for very big important buildings; to build castle roofs for example. Most ordinary people thatched their roof with different natural materials, including straw, grass and heather. However, by the late 1800s it became normal for everyone to use slate. Aberfoyle Slate Quarry became a real industry in the early 1800s. The quarry was located in a remote location, which was difficult to reach. As a result, the men who worked at the quarry also had to live there. In the early days, they lived in a wooden bunkhouse; by the 1890s the Aberfoyle Slate Company had built several rows of houses for them and their families to live in. The houses were known as "The Aberfoyle Cottaries" and they soon became a small village, which even had its own school. Today, only the Hill Cottage still stands - the rest of the village is gone. In 1891 William MacKenzie, the quarry foreman, lived in the first house built at the quarry called Hill Cottage. The quarrymen and their families had strong connections with the other slate quarries in the Highlands. These families sometimes moved around the quarries, depending on the availability of work. 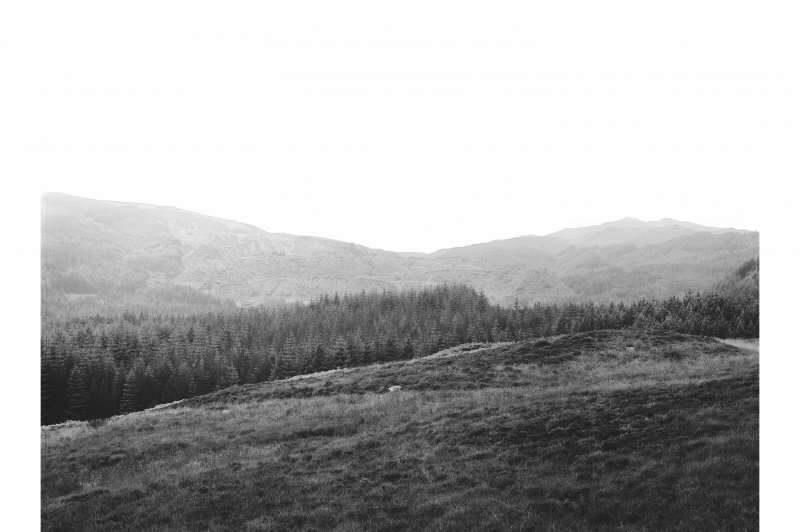 Aberfoyle is located close to Glasgow and by the 1900s English would have been the main language spoken. Many families who lived at The Cottaries, however, spoke both Gaelic and English. This is probably because they still had strong family ties to the Highlands. Despite having to move to The Cottaries for work, a lively and active community grew. There was a community hall called "the Guild", where dances and other social events would happen. Despite living up the hill from Aberfoyle, there were also good relations with the town. The red sandstone church, Old St. Mary's, in Aberfoyle was built primarily because the quarriers, including David MacKenzie, Ronald Wilson and Duncan and Nellie Robertson, decided a church building was needed. Later, the quarry community was also largely responsible for setting up a co-operative food store in Aberfoyle. They obviously saw The Cottaries as a home and not a temporary place to live.